We all need people to help us find the way. In this stirring new book, acclaimed author and educator Eric Liu takes us on a quest for those guiding lights. He shares invaluable lessons from people whose “classrooms” are boardrooms, arenas, concert halls, theaters, kitchens, and places of worship–and in the process, he reveals a surprising path to purpose. As he entered fatherhood and a phase of changing ambitions, Eric Liu set out in search of great mentors. He found much more. He encountered people from all walks of life, from all across the country, with something powerful to pass on about how to change lives. Among those Liu portrays in vivid and fascinating narratives are one of Hollywood’s finest acting teachers, who turns a middling young actress into a project for transformation; an esteemed major league pitching coach, haunted by the players he’s let down; a rising executive whose eye for untapped talent allows her to rescue a floundering employee; a master clown whose workshop teaches a husband-and-wife team to revamp their relationship, onstage and off; a high school debate coach whose protégée falters at the pinnacle, and thus finds triumph; and a gangland priest who has saved many and yet still must confront the limits of his power to heal. In these pages are remarkable stories of apprenticeship–of failure, hope, and discovery. These are stories of men and women who learned to hear the sound of other people’s voices and, in so doing, found their own way to a better and fuller life. As Eric Liu reminds us, these are our stories. 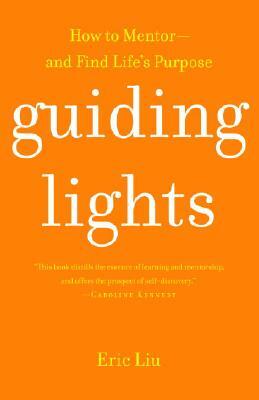 Lyrical and accessible, Guiding Lights is a course to benefit any reader, a superb work of narrative nonfiction, and an exciting departure for its accomplished author. This book will change how we live, lead, learn, and love. Pass it on. ERIC LIU is a fellow at the New America Foundation. He writes the “Teachings” column for Slate and is the author of The Accidental Asian: Notes of a Native Speaker, a New York Times Notable Book featured in the PBS documentary "Matters of Race". Liu served as a speechwriter for President Clinton and later as White House deputy domestic policy adviser. He lives with his wife and daughter in Seattle, where he teaches at the University of Washington’s Evans School of Public Affairs. "Through inspiring examples and luminous prose, Eric Liu reminds us that we have the capacity to be both teachers and students throughout our lives. This book distills the essence of learning and offers the prospect of self -discovery to all who listen to its GUIDING LIGHTS. "Rich with the kind of insight that can only be earned through beautiful storytelling. This is unique journalism, brave in its willingness to be intimate. Eric Liu is a writer with chops and a writer who cares."